Ok guys im doing a full refit on a 26' landing craft at the monment. this boat has been messed with A LOT over the years. She originally started life as a 350 Merc/ Hamilton jet set up, and for some reason it was pulled and transom and porch cut out and notched for a o/b. 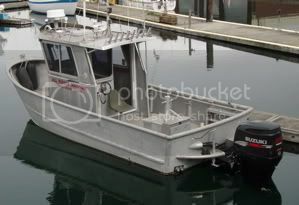 had a 225 hp oceanrunner i have no performance info for the old motor but now shes getting treated to a Honda 225. The hull has a delta pad has the remnants of the jet intake still there, which i found today was only covered with .125 sheet that was held in place with self tapping screws and 5200!! So that brings me to the big question for hopefully some one here is more familiar with delta pad hulls than I am. We will be raising the transom for the Honda which is a 30" leg and i am not overly sure where to set the height, i would assume it would be a little below the pad. the boat is going to be used as a work/ tow boat for the most part so not super worried about top speed on this build. ill try and take some pictures of this thing later on.